Note: If this soldier enlisted before 9/1/62, and was with the regiment on 9/13/62, he would have briefly been taken prisoner along with the entire regiment at Harper's Ferry. Read the blue section of the unit's Organization and Service for details. Rank and Organization: 1st Lieut., Co. H, 9th Vermont Infantry. Place and date: Newport Barracks, N.C., 2 Feb 1864. Born: 22 Mar 1843, Burlington. Date of Issue: 8 Sep 1891. Citation: By long and persistent resistance and burning the bridges, kept a superior force of the enemy at bay and covered the retreat of the garrison. 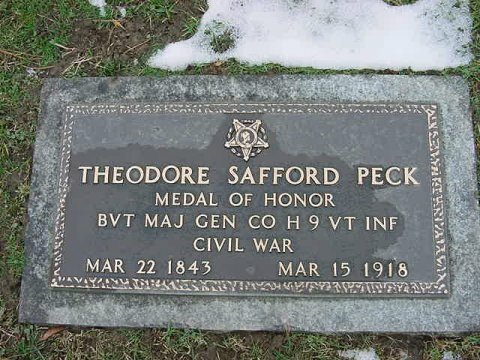 Theodore Safford Peck was born in Burlington, March 22, 1843. He enlisted at the age of eighteen as private in Co. F, 1st Vt. Cavalry, Sept. 1, 1861; mustered into United States service, Nov. 1, 1861; transferred to Co. K, and discharged for promotion, June 25, 1862; appointed, by Col. George J. Stannard, regimental quartermaster-sergeant, 9th Regt., Vt. Infantry, June 25, 1862; promoted 2d lieutenant, Co. C, Jan. 7, 1863; promoted 1st lieutenant, Co. H, June 10, 1864; acting regimental quartermaster and adjutant, also acting assistant adjutant-general, aid-de-camp, and brigade quartermaster, 2d Brigade, 2d Division, 18th Army Corps; promoted captain and assistant quartermaster, United States Volunteers, March 11, 1865; assigned to 1st Brigade, 3d Division, 24th Army Corps. He served on the staffs of Brevet Maj. Gen. George J. Stannard, Brig.-Gen. Isaac J. Wistar at Suffolk, Va., Brig.-Gen. Joseph H. Potter, Brevet Brig.-Gen. Michael T. Donahue, and Brevet Brig.-Gen. Edward H. Ripley, in the trenches in front of Petersburg and Richmond, Va. In the Vermont cavalry he was present in action at Middletown and Winchester, Va., May 24 and 25, 1862; in the 9th Regt., Winchester, August, and Harper's Ferry, Va., Sept. 13, 14 and 15, 1862 (captured and paroled); siege of Suffolk, Nansemond, Edenton Road, Blackwater, May, 1863; Yorktown and raid to Gloucester Court House, Va., July and August, 1863; action of Young's Cross Roads, December, 1863; Newport Barracks, Feb. 2, 1864; raid to Swansborough and Jacksonville, N. C., May, 1864; Fort Harrison, Sept. 29 and 30, 1864; Fair Oaks, Va., Oct. 29, 1864; was present in New York City commanding a battalion, 9th Vt. Regt., in November, 1864, at the second election of President Lincoln. He was also present in the siege (winter, 1864, and spring, 1865) and capture of Richmond, Va., and was with the first organized command of infantry (3d Brigade, 3d Division, 24th Army Corps) to enter the confederate capital at the surrender on the morning of April 3, 1865; his brigade was also provost guard of the city for two weeks after its capture. He was wounded Sept. 29, 1864, in the assault of Fort Harrison, Va. He received a medal of honor inscribed as follows: "The Congress to 1st Lieut. Theodore S. Peck, Co. H, 9th Vt. Vols., for gallantry in action at Newport Barracks, N. C., Feb. 2, 1864." 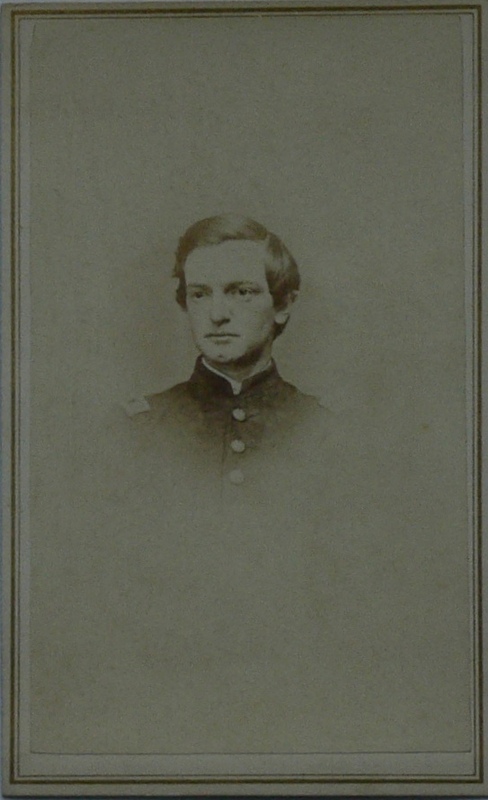 Captain Peck was mustered out of the United States service on account of the close of the war, June 23, 1865, having served nearly four years as a private in the ranks, an officer in the line and on the staff, a member of the cavalry corps and also of the 1st, 4th, 9th, 18th, and 24th army corps in the armies of the Potomac and the James. The government at the close of the war offered him two commissions in the regular army, which were declined. Upon his return to Vermont he was appointed chief of staff, with rank of colonel, by Governor John W. Stewart; afterwards colonel of the first and only regiment of infantry of the state, which position he held for eight years. In 1869 appointed assistant adjutant-general of the GAR department of Vermont, and by his energy and tact saved the order from going to pieces; in 1872, senior vice commander, and in 1876-'77 department commander. In 1881 he was appointed adjutant-general of Vermont, with rank of brigadier-general, and is on duty in this office at the present time. 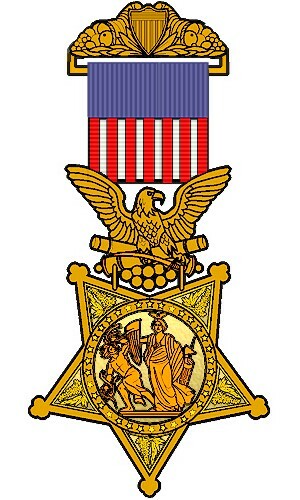 He is a charter member of the Vermont Commandery Military Order of the Loyal Legion and was a vice president-general of the National Society, Sons of American Revolution. He had four ancestors in the Revolutionary war and one in the war of 1812. General Peck was appointed by President Harrison a member of the board of visitors at the United States Military Academy at West Point in 1891. He is a resident of Burlington, following the business of general insurance, and representing fire, life, marine and accident companies, the aggregate capital of which amounts to about $300, 000, 000, the business extending throughout the United States and Canada. On the 29th of October, 1879, he married Agnes Louise, daughter of the late William Leslie of Toronto, Ont. They have one child: Mary Agnes Leslie. General Peck is a man of public spirit and enterprise. In politics he is a loyal Republican. He is a member of the Masonic and other fraternities, and was for ten years grand marshal of the Grand Lodge of mont. Source: Jacob G. Ullery, compiler, Men of Vermont: An Illustrated Biographical History of Vermonters and Sons of Vermont, (Transcript Publishing Company, Brattleboro, VT, 1894), Part II, pp. 305. See also: Beyer and Keydel, 301. NARA File Number: R&P 296635.